Hi everyone! I'm sharing another friendship card today over on the Honey Bee Stamps Blog. This A2 sized card features Mae the Mouse and a custom inked ombre' panel with a heart cut out. Please stop by over there for more details. Have a wonderful Thursday! Hello everyone! It's the last Wednesday in January so that means this is my last guest post for the MFT Sketch Challenge. I've enjoyed playing with all the sketches this month and I hope I've given you all a little inspiration along the way. For this week's sketch card, I used the horizontal bands at the top left as a jumping off point for the design. This card is a pocket shaker. I started with an A2 size panel of Bristol Smooth card stock and blended on a combination of Seedless Preserves and Shaded Lilac Distress Oxide inks. I then white heat embossed tiny white hearts over the entire panel using the Scattered Hearts Background stamp. I slipped the panel into a stamp storage pocket, added some glitter and heart confetti, and then folded over the open end of the pocket and secured it the back. I then decorated the outside of the pocket. I used the Lots of Hearts Outlines and the Straight From the Heart Die-namics to die cut the hearts and arrows. The glitter card stock I used is MFT's Silver Sparkle. I silver heat embossed the sentiments onto some white card stock and then die cut using one of the Stitched Fishtail Sentiment Strips plus one Essential Fishtail Sentiment Strips Die-namics. The sentiments are from Sweet Celebrations and Sweet Nothings. I used some strong double sided adhesive to secure the shaker panel to an A2 side folding card base and my card was complete. You can never have too many friendship cards on hand. It's always fun to send happy mail to our crafty friends and I've made a bright and cheery card that will let a special friend know just how much their friendship means. 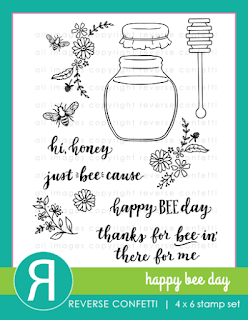 Please join me over on the Honey Bee Stamps Blog for more details. Hi frineds! Welcome to another Wednesday Sketch Challenge. There's a new sketch on the MFT Challenge & Inspiration blog and it's a great one! I simply could not resist using the Friendly Fox Die-namics for this one. I've used the fox in lieu of the circle element, but otherwise I stuck very close to the sketch. I started by die cutting all the fox pieces from kraft, white, and dark grey card stock. I lightly blended some Fired Brick Distress Oxide ink over the kraft pieces to give them a reddish tint. I added a little bit of blush to the cheeks on his face and once assembled fully I used a white gel pen to add highlight details. I trimmed a piece of the pink heart pattern from the Sweet Stack paper pack to be about one inch narrower than the A2 card base and adhered it to be lined up along the right edge. I added the fox with foam squares. For embellishment, I die cut three hearts using the Lots of Hearts Outlines Die-namics. I white heat embossed Happy Valentine's Day on dark grey card stock, trimmed into a slim banner strip, and layered with one of the hearts. The sentiment comes from the Sweet Celebrations stamp set. Lastly I added just a few Silver Moondust Nuvo Glitter Drops. MFT has another fun mid month release and it's all available for purchase today! I'm sharing three cards featuring stamps and dies from the Heart Art card kit and newest set designed by Stacey Yucula called Joyful Heart Bears. This first card showcases some of the fabulous products found in this month's card kit. 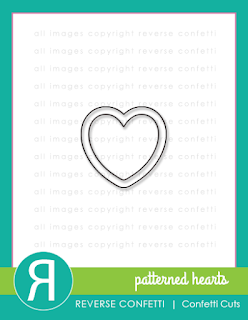 I've used the Heart Trio Shaker Window Die-namics to create a gird design on an A7 card. 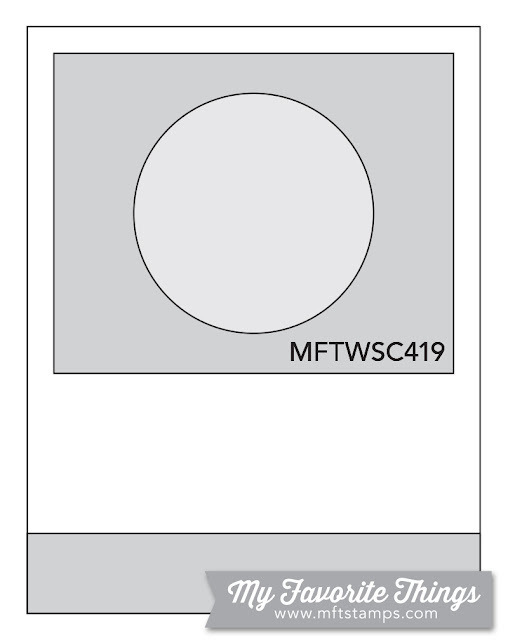 I just ran a 5x7" white card stock panel through my die cut machine 4 times to create the grid. 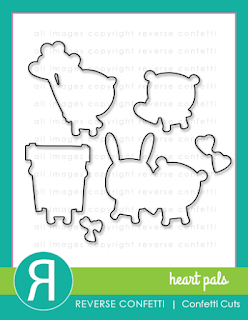 I then filled up each heart cut out with different elements. I used the Heart Trio Shaker Pouches to fill one row with tiny heart confetti. 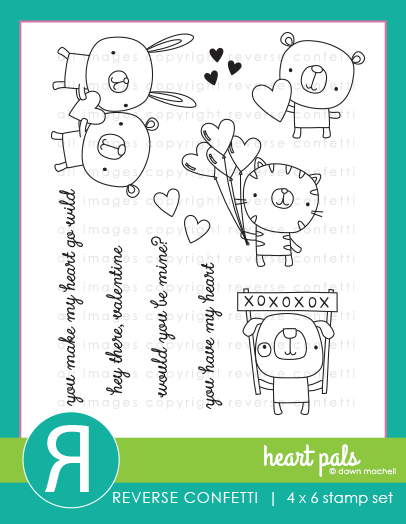 I also used the new Heart Art stamp set to fill three spots. Then I die cut hearts out of different patterns from the Sweet Stack paper pack and inlaid into the remaining openings. Lastly I stamped Happy Valentine's Day from Sweet Celebrations and adhered it right onto the center shaker pouch. For my second card, I combined the Joyful Heart Bears set and Double the Love Die-namics to create a slimline card. This card features a clean and simple scene with a LOVE cut out. I started with a Bristol Smooth card stock panel the measures 3x8". I stenciled some clouds on to the top half and then sponged on some Worn Lipstick Distress Oxide ink to the bottom. I die cut the LOVE in the lower left side of the panel and backed it with a diagonal stripe pattern from the Sweet Stack paper pack. I Copic colored one of the bears from Joyful Heart Bears along with the butterflies and added them to the scene. I stamped part of the sentiment just to the right of the bear. Lastly I hand drew in some trails behind the butterflies. I added the completed panel to a 3.5 x 8.5" card base. I made another card using the Joyful Heart Bears set that has a scalloped circle cut out to spotlight the sweet bear hugging the heart. I started with a square card base that measures 4.5 x 4.5 inches. I trimmed the diagonal stripe paper slightly smaller. I created the window panel with the largest die from the Stitched Mini Scallop Squares and Jumbo Peek-a-Boo Windows. I backed the window with an inked panel and layered it over the stripe paper with foam tape. I tucked the bear into the window and added the butterflies and some clear sequins. I white heat embossed a sentiment from Joyful Heart Bears onto some red card stock to complete the card. How about some sweet Valentine's inspiration for your Thursday?!? I created a heart shaped box of Valentine treats my card today. 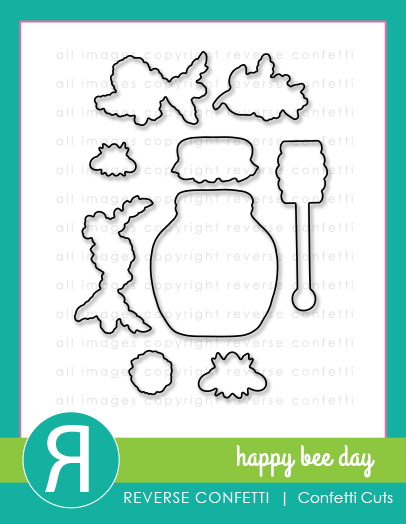 Please visit the Honey Bee Stamps Blog for all the details! Hello everyone! Welcome to another MFT sketch challenge. 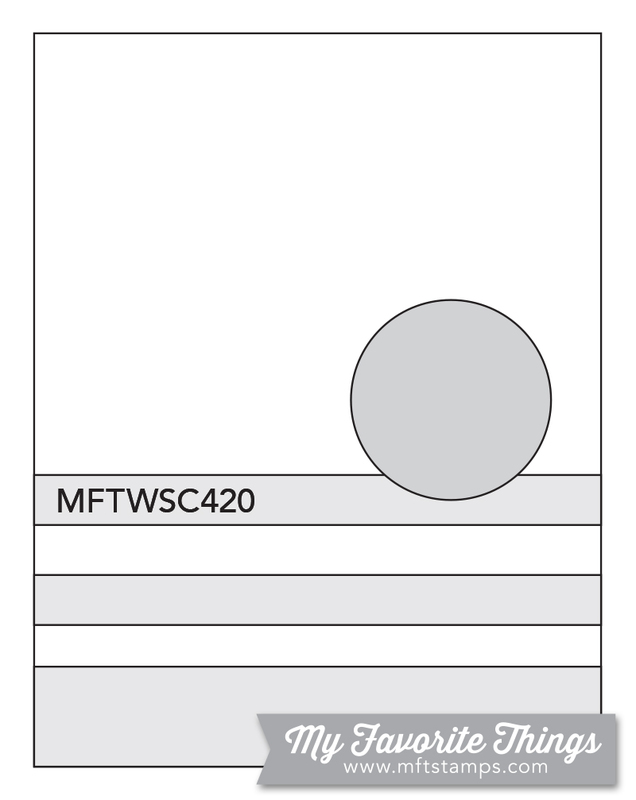 from the Sweet Stack paper pad for the stipes. There's some great patterns to choose from. I also pulled out the new Tweethearts stamp set and used two of the birds and birdcage for my focal point images. I colored the birds to coordinate with the pattern paper. I stamped 3 hearts and added some sequins for a little embellishment. Lastly I stamped one of the sentiments from Tweethearts. Orignally I followed the sketch and had the sentiment more towards the left edge, but I decided to move it over where you see it now. I love how this card turned out even though it's not my usual multi layer scene card. The sketch made it easy to create an eye catching design using the bright and cheery pattern paper. I followed the sketch very closely this week. I wanted to use the circle element to spotlight the fun tree image in the Wonderful Woodland Friends set. I started with an A2 white card base. I used some tiny heart patterned paper from the Sweet Stack paper pad for the top and bottom portion of the card. I die cut the circle opening with one of the Jumbo Peek-a-boo Circle Windows. I die cut a grass border with one of the Grassy Edges Die-namics and sponged on some Bundled Sage Distress Ink. I added the grass border and all my Copic colored images to create my scene. I centered the tree inside the circle panel which is popped up with foam tape. I stamped the sentiment which is also from the Wonderful Woodland Friends set. Lastly I tied some baker's twine around the bottom pattern paper strip. Hi everyone! 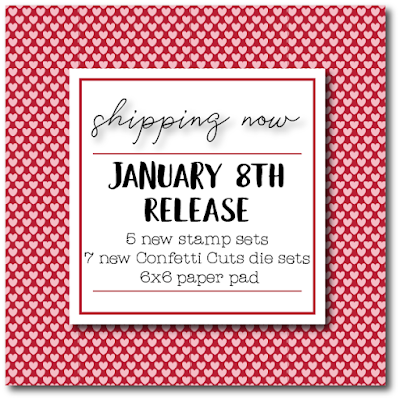 I'm thrilled to be joining the Reverse Confetti team today in celebrating the fun January release which is now available. If you've been hopping along, you should have arrived from Lisa Henke's blog. Your next stop on the hop will be Wanda Guess. The complete hop list and all product images that I used on my cards today are included at the end of the post. 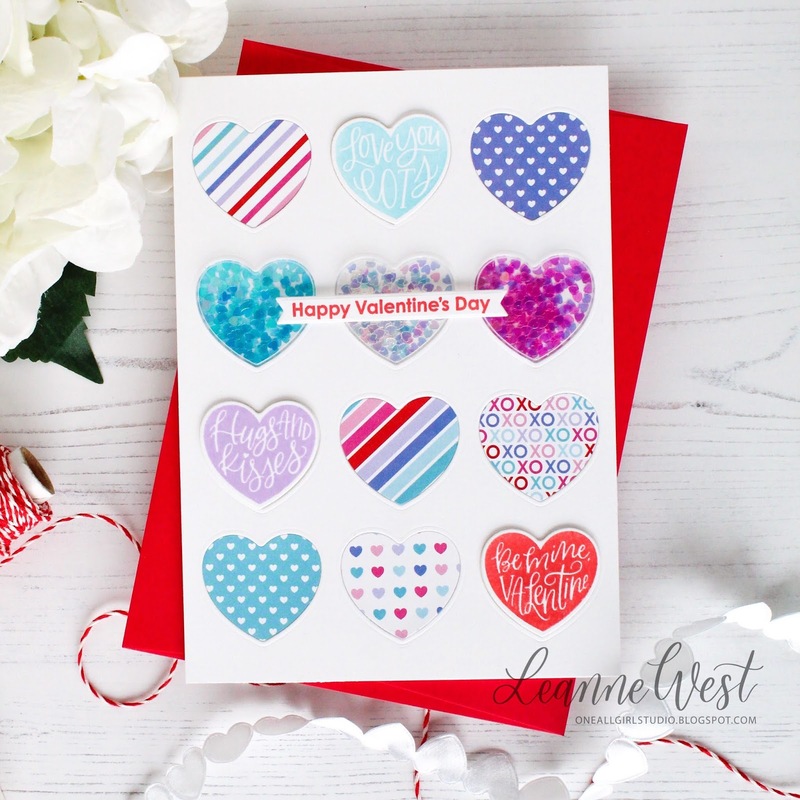 I've got 3 cards to share with you today using some of the new stamps and dies - two that are very Valentine themed and one that could be used for any occasion. 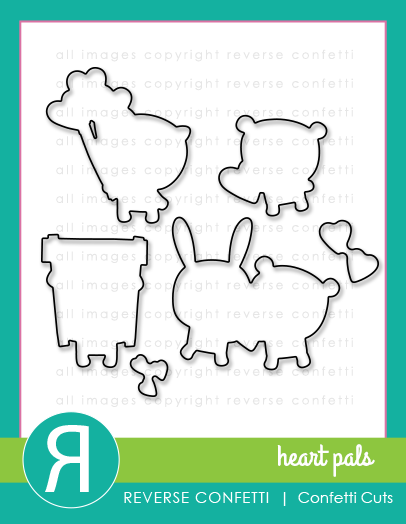 First up are two Valentine's Day cards that feature the adorable characters from the Heart Pals stamp set. I've colored all the images with Copics and die cut with the coordinating Heart Pals Confetti Cuts. For the "hey there, valentine" card, I decided to make a shaker card. I started by ink smooshing some Salty Ocean Distress Oxide Ink onto a Bristol Smooth card stock panel cut slightly smaller than A2 size. I used the Patterned Heart Confetti Cuts to die cut two heart shaped openings. I white heat embossed the tiny heart in a cascading pattern. I created the shaker part and then tucked the bear and cat into the openings by adhering them right onto the acetate. For my second card, I wanted to make a slimline card which measures 8.5 x 3.5 inches. 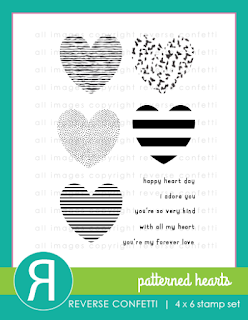 I stamped a few of the Patterned Hearts with white pigment ink onto some kraft and berry red card stock. I then die cut with the coordinating Patterned Hearts Confetti Cuts. I lightly sponged on some Salty Ocean Distress Oxide Ink onto the top and bottom edge of the card base. I trimmed a white panel narrower than the card base and adhered with foam tape. I added the hearts in row but left space for the bunny and bear. Lastly, I tied some baker's twine around the bottom of the white panel. 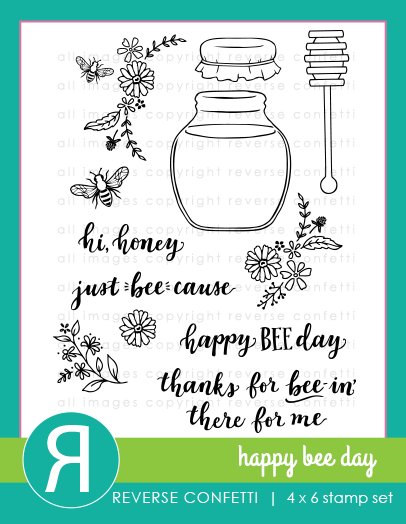 For my final card, I used the Happy Bee Day stamp set. This is an A2 sized card with a front panel cut slightly smaller. I blended on some Tumbled Glass Distress Oxide ink, keeping it lighter towards the center of the panel to create a spotlight effect. 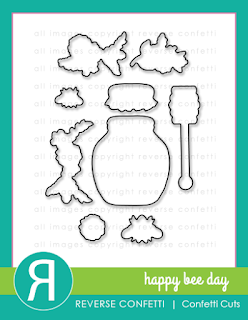 I colored the images with Copics and die cut with the coordinating Happy Bee Day Confetti Cuts. I wanted the honey jar to look as though it was sitting on a table cloth. I used the smaller die in the Scalloped Squares Confetti Cuts to create the table cloth. For a little extra detail, I hand drew the dashed lines for the bee trail and added a few sparkling clear sequins. I have a bit of happy news to reveal today... I've joined the Purple Onion design team! I have always admired Stacey Yacula's completely adorable and whimsical illustrations. 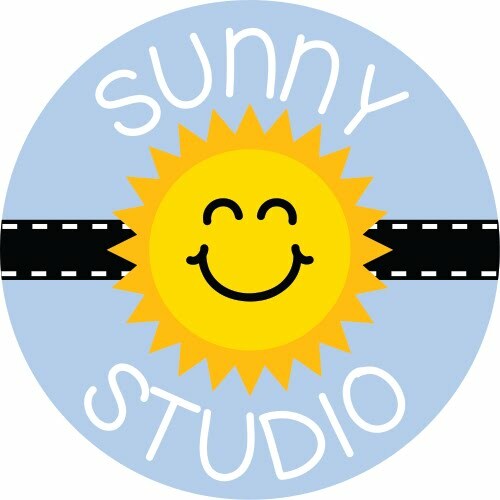 Purple Onion Designs is a fabulous source for high quality red rubber stamps featuring so many of Stacey's cute critters. Naturally I'm thrilled to have this opportunity to be creating with them. So to celebrate, I have a springy scene card to share. From the first moment I saw the Blossoming Perch stamp, I knew exactly what I wanted to do.... make a frame with it. It was easy enough to do! Just simply stamp four times, color, and fussy cut. Each branch is slightly overlapping in the corners to form a square shape which I think frames up my little scene nicely. The brach frame measures approximately 4.25 inches square. I added it to a die cut scalloped frame that was just a tad bigger but you certainly could just use the branch frame by itself. 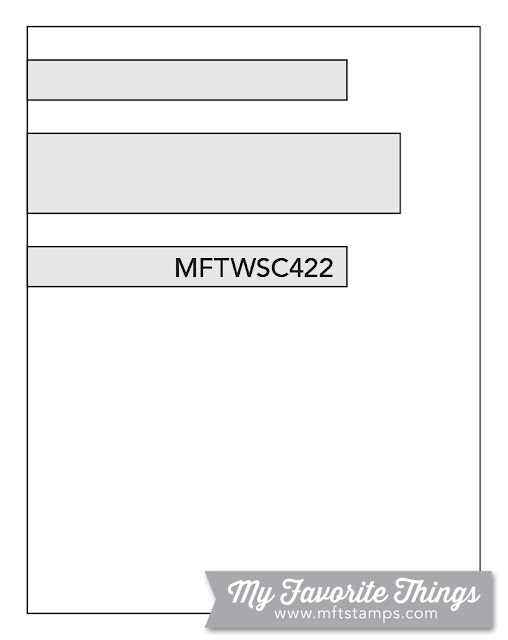 My card base is 5x5 inches which leaves a nice border around the outside. Happy 2019 everyone! 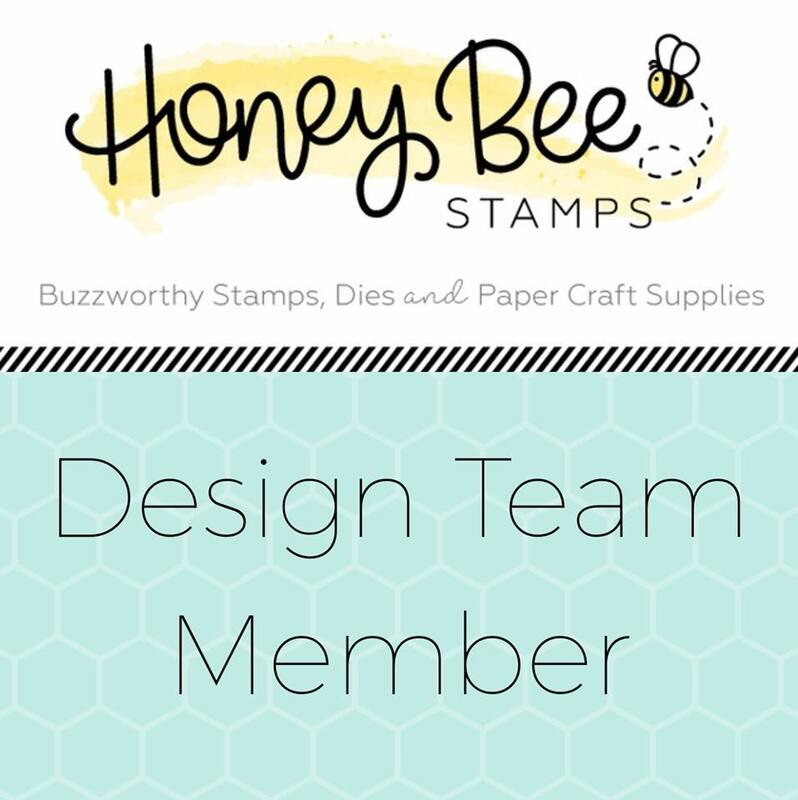 I'm happy to announce that I will be continuing on the Honey Bee Design Team. YAY! I'll be sharing projects on the Honey Bee blog every Thursday. I'm starting 2019 off with a fun birthday card featuring a cupcake created with the Cupcake Builder Honey Cuts. Join me over on the Honey Bee Blog for more details. Hi Everyone! Happy 2019! I'm starting the new year off with some exciting news - I'm the featured designer for the weekly Sketch Challenge over on the My Favorite Things Challenge & Inspiration Blog. I'll be sharing a project every Wednesday during the month of January. For those of you that are new to the Sketch Challenge, it's a weekly challenge in which you can create and link up any project you make inspired from the sketch provided. And the best part is you'll have a chance to win a $50 gift voucher to the MFT shop! I have two cards to share that were inspired by the sketch. 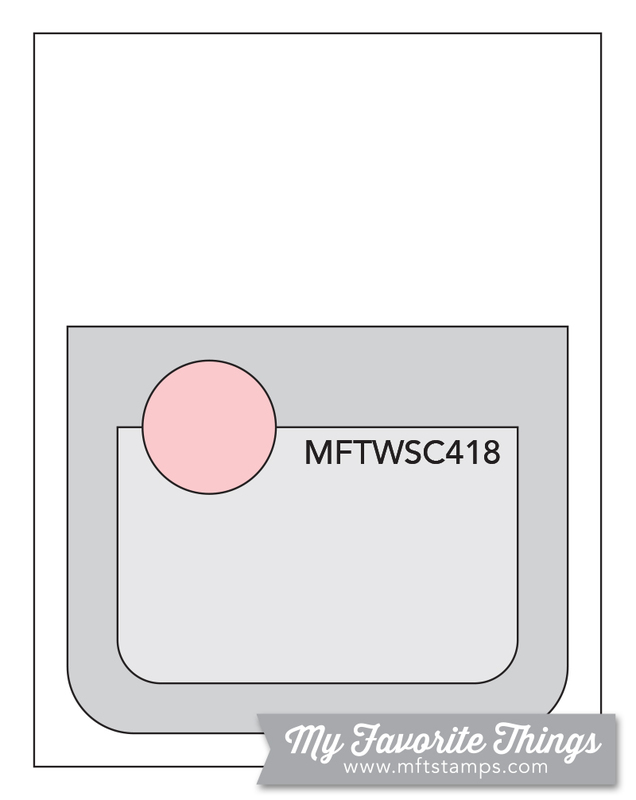 I'll point out all the MFT products used and touch upon some specifics for each card. Both cards feature adorable little birds from the SY Tweet Friends stamp set. I drew inspiration from the nested panel part of the sketch. 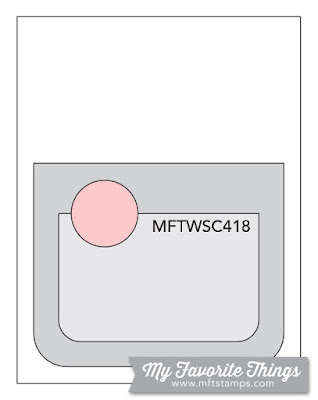 I used the two largest dies in the Blueprints 33 Die-namics to create my nested panels. For the birthday card, I did some partial die cutting to alter the original Blueprints 33 die cut shape to accommodate the images and sentiment. I made my own custom colored card stock for all the die cut elements. I used white Bristol Smooth card stock and sponged on some Distress Oxide Ink. The Distress colors I used are Bundled Sage, Tumbled Glass, and Spun Sugar. I used the You Trio Die-namics to die cut the "you". For the first card I used the negative cut which serves as a design element and part of the sentiment. Then I used the positive die cut letters on the second card. Instead of using a circle accent like in the original sketch, I opted for a heart shape. I used the smallest die in the Stitched Heart Stax Die-namics for this part. 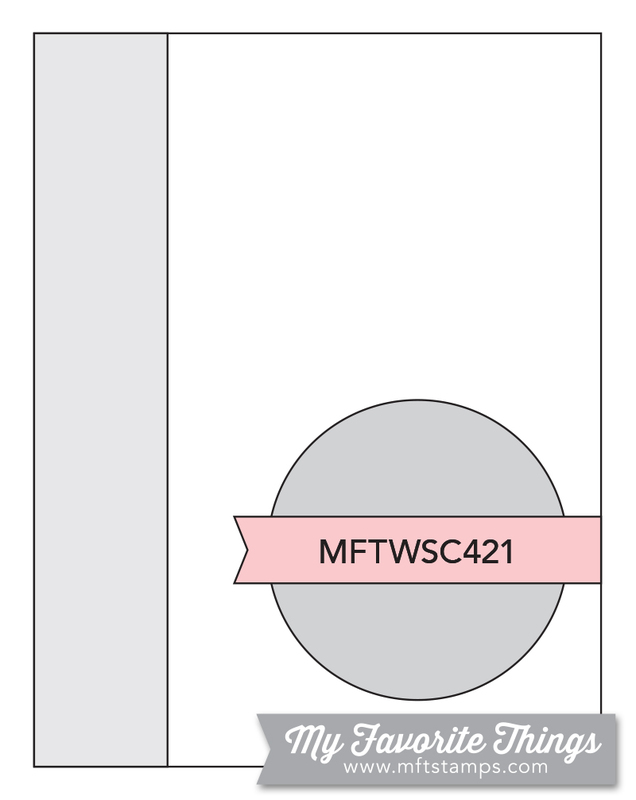 Be sure to check out the MFT Challenge Blog for more inspiration from the design team using this week's sketch.